Prepper Life Skill (PLS). Learn to disinfect your plumbing system or well. This is a skill not every prepper will need, but it’s useful to know about. In many areas, if you do major rework or install new pipes for your plumbing system, you are expected to disinfect the piping. Minnesota plumbing code says to flush the system with potable water until the exiting water is clear and then that “…the system or part thereof shall be filled with a water-chlorine solution containing at least 200 parts per million of chlorine and allowed to stand for three hours.” Many jurisdictions have similar code. Wells can become contaminated because of flooding. Minnesota residents in flooded areas are being informed about this by local news. It’s the usual prepper story: Use bottled water or bring your water to a roiling boil for a few minutes if you’re not sure your water is safe to drink. After floods, local governments often provide free water testing kits to see if your well water is safe. If your water comes from a utility, after a flood, you can contact your water provider to be sure your water is safe. Duluth was drenched with 10″ of rainfall. The good news is that the waters are receding and polar bears are no longer roaming the streets. The bad news is that cleaning up after a flood is icky and many homeowners will find their insurance won’t cover flooding. The Star Tribune had a good article “Duluth Shows The Risk of Betting Against Floods.” It says only 111 homeowners of the city’s 25,485 homes had flood insurance. The article encourages people to give some thought to whether they should carry flood insurance. 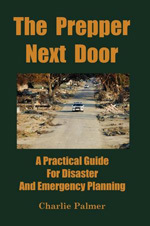 A nice article about preppers and insurance can be found on tracemypreps.com which is a great blog for preppers. For those who want a detailed roadmap of how to clean up after a flood, FEMA provides a nice pdf (“Repairing Your Flooded Home“) you can download from the American Red Cross. ► When Americans were told they could have unlimited access to any single thing after a catastrophe or disaster, 55% wisely selected water. ► We must take any survey with a grain of salt. You never know if people are being serious or not. When asked what movie scenarios could come to pass in the next 25 years, 7% said a Planet of The Apes scenario could happen. The participants were over 18 years old. americanpreppersnetwork.com has a good commentary about how the new show “Doomsday Preppers” might change how people view preppers. One topic I omitted from The Prepper Next Door was the topic of PC security. The subject was just too far away from what readers might expect in a book about prepping. In the modern world, being prepared means you’re alert to the risk your PC faces and you have at least some idea of how to handle these risks. It’s been estimated that Iran’s nuclear program has been set back by 6 months to 1 year because of the Stuxnet worm and the Flame virus. We know Stuxnet was created by the U.S. government. The cyber-weapon interfered with the operation of 1,000 nuclear centrifuges. Because Stuxnet ran a bit out-of-control, it was discovered by computer security experts, who reverse engineered the worm. Flame, also courtesy of the US government, was a virus masquerading as a windows update. ► Regularly update our operating system. ► Regularly backup important files so if our system were damaged, we could restore them. Norton Ghost is one popular program for copying a hard drive or backing up a PC. All PC users should devote a little time to learning more about basic computer security. While this cyber-weapon did more or less what was intended, using such weapons sets a dangerous precedence. What happens if one of these cyber-weapons runs amuck and attacks a non-targeted country? How would Russia or China respond if the US inadvertently damaged a billion dollars worth of their infrastructure? You can be sure we’d need to pay the bill or face retaliation. The careless use of cyber-weapons attacking industrial targets could inadvertently lead to a shooting war.